“Gladly servicing all of western Pennsylvania” Fill out our form today for $200.00 off your estimate! click HERE to use our convenient form to send your request and someone will call you soon. For years, in order to achieve a fresh new look for your kitchen cabinets, replacing the entire cabinets was your only value-added option. Yes, you could paint over your cabinets, but depending on the composition of the cabinets, your job could end up looking like a young child was set free in your kitchen with paints and a brush. Today, cabinet refacing has become a close substitute to cabinet replacing. To better understand the difference, you will need to know what is involved with each. Cabinet refacing entails the removal of drawer faces and doors and installation of new ones. Your existing cabinet boxes remain intact and veneer is added to them during refacing. With cabinet replacing, your existing cabinets are completely removed and replaced with new cabinets. This is often considered a full kitchen remodel. Which is the right option for you? 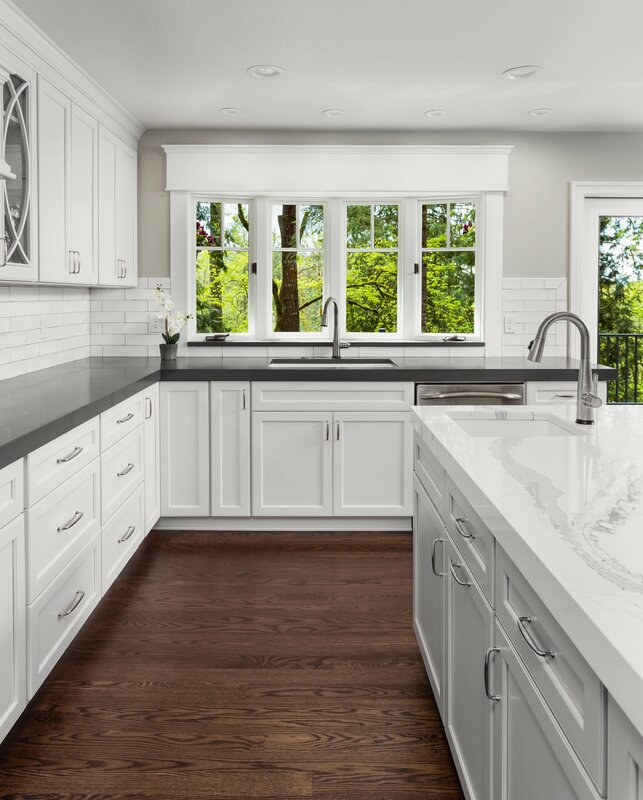 Pittsburgh’s Desirable Kitchens & Refacing suggests considering five factors when choosing whether to reface or replace your cabinets. Overall Layout – Are you satisfied with the current layout of your kitchen? If yes, then refacing is a great option for you. If you are looking to make minor (or major) changes to your kitchen’s overall layout and design, then cabinet replacing would be the best long-term and cost-effective solution for your home. Condition of Cabinets – Are your cabinets structurally sound? If yes, then there is no immediate need to replace with new ones. Refacing your existing cabinets will save you time and money. If your kitchen cabinet boxes, doors or drawers are in poor condition, refacing will not correct the problem. New cabinets will need to be installed. Additionally, if you are not satisfied with the placement of your existing cabinets, whether they were poorly installed initially or they do not functionally serve your needs, then cabinet replacing is your best option. Cost – What type of budget have you allocated for your kitchen transformation? Typically cabinet refacing costs 40-50% less than cabinet replacing. Depending on the type of refacing desired (and the size of your kitchen), expect to pay anywhere from $1000 to $9,000+ for cabinet refacing. Time – Are you looking for a quick, hassle-free kitchen transformation? Cabinet refacing is a quick and simple process when hiring experienced professionals, such as Desirable Kitchens and Refacing. Most refacing projects are completed in 3-5 days or less—without the mess and the hassles of a remodel project that could leave you without a kitchen for months. During cabinet refacing, you are still able to utilize your kitchen. With cabinet replacing, more removal and installation is involved which translates into more time and disruption in the kitchen. Depending on the time you have and the disruption you can afford, cabinet replacing may still be a feasible option for you. Environment – Are you concerned about how eco-friendly these two options are? With cabinet refacing, there are less items being thrown into the landfills, which makes it the more eco-friendly choice. Unfortunately, cabinet replacing involves the disposal of complete cabinets—boxes, doors, drawers and hardware—which ends up sitting in a landfill. Dedicated kitchen remodelers, such as Desirable Kitchens & Refacing in Pittsburgh, PA, work with you to find the most cost effective and time efficient way to upgrade your kitchen, while adding value to your home. From cabinets to countertops to flooring, you will want to choose what is right for you. For years, Desirable Kitchens & Refacing has been transforming kitchens in the Pittsburgh and surrounding areas. For a free consultation or more information, call 412-515-0582 or visit http://www.pittsburghdesirablekitchens.com. 2017 by Desirable Kitchens & Refacing Web Design by Higher Images, Inc.